Shooter is an action-packed conspiracy thriller based on the novel, Point of Impact, by Stephen Hunter. Jonathan Lemkin wrote the screenplay, and Antoine Fuqua directed it. 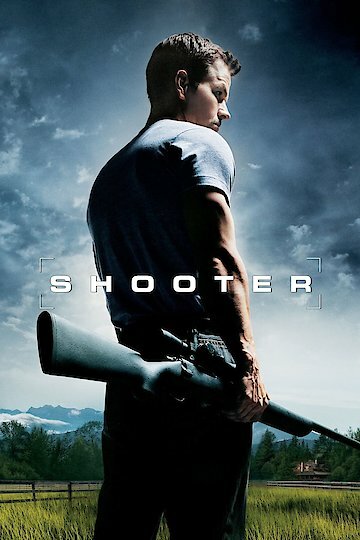 The film stars Mark Wahlberg as Bob Lee Swagger, a retired top-notch U.S. marine scout sniper who chooses a life of exile, after a mission results in tragedy. Swagger is tracked down in his mountain retreat, and coaxed back into service at the request of Colonel Isaac Johnson (Danny Glover), to help thwart an attempt on the life of the President of the United States. Swagger is given a list of three cities the President will be visiting, and is asked to figure out which one is the best bet for a long-range, high-powered rifle assassination to take place. A location in Philadelphia is the site Swagger believes to be the most likely, and that determination is passed on to Colonel Johnson. When a shooting occurs, Swagger is shot and wounded by a police officer: He’s been set up to take the blame for the assassination and now he has to escape the manhunt that’s been organized to find him. Special Agent Nick Memphis (Michael Pena) has a run-in with Swagger, but Swagger manages to get away from the FBI agent, and is helped by Sarah Fenn (Kate Mara), the widow of his spotter and close friend who died in a mission years before. Laced with riveting action sequences, plot twists, and fiery explosions, Shooter is the story of a man fighting to save his life, clear his name, and achieve justice. Former U.S. Marine scout sniper, Patrick Garrity, was appointed technical advisor by Fuqua. The film illustrates a number of sniper tactics which Garrity taught to Mark Wahlberg, among them the ability to shoot right and left-handed, develop breathing skills, and judge the effect of wind on a shot. Shooter is currently available to watch and stream, buy on demand at Amazon, Vudu, Google Play, FandangoNow, iTunes, YouTube VOD online.